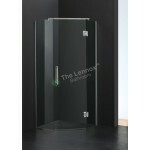 The Premier Frameless Sliding Door feature a fixed glass panel with a beautiful swing frameless glass door and are available either left or right hand opening, with matching side panels for corner installtions. Standing 1.9m tall, with outstanding features and complementing chrome designer hinges the Premier Frameless Range offers both beauty and usability. 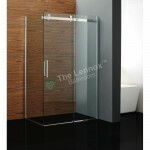 All Premier Frameless products are treated with specially formulated Nano Glass Protection.